Mike Greene - mgreene@shawmedia.com Brenda Dahlfors cuts rhubarb in one of her gardens Thursday, April 5, 2012 at her home in Woodstock. Dahlfors, program coordinator for the Master Gardener program in McHenry County, is concerned that local fruit could be harmed by frost hitting the area. Mike Greene - mgreene@shawmedia.com Brenda Dahlfors (cq) grabs a handful of ornamental grass while maintaining one of her gardens Thursday, April 5, 2012 at her home in Woodstock. Dahlfors, program coordinator for the Master Gardener program in McHenry County, said she was unable to cut the grass last year after a duck used the area to lay eggs. 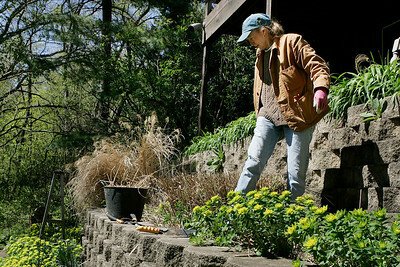 Mike Greene - mgreene@shawmedia.com Brenda Dahlfors (cq) surveys one of her gardens while trimming ornamental grass Thursday, April 5, 2012 at her home in Woodstock. 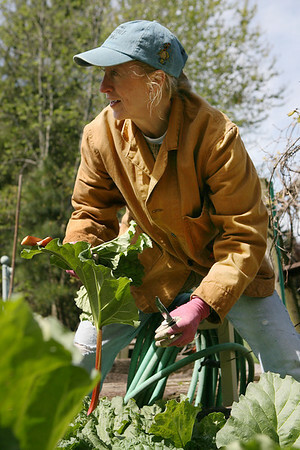 Dahlfors is program coordinator for the Master Gardener program in McHenry County. 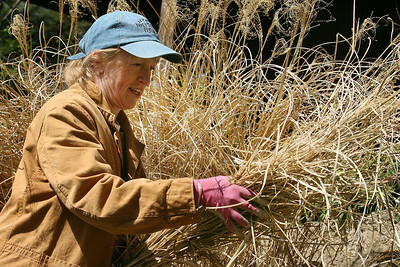 Brenda Dahlfors (cq) grabs a handful of ornamental grass while maintaining one of her gardens Thursday, April 5, 2012 at her home in Woodstock. Dahlfors, program coordinator for the Master Gardener program in McHenry County, said she was unable to cut the grass last year after a duck used the area to lay eggs.